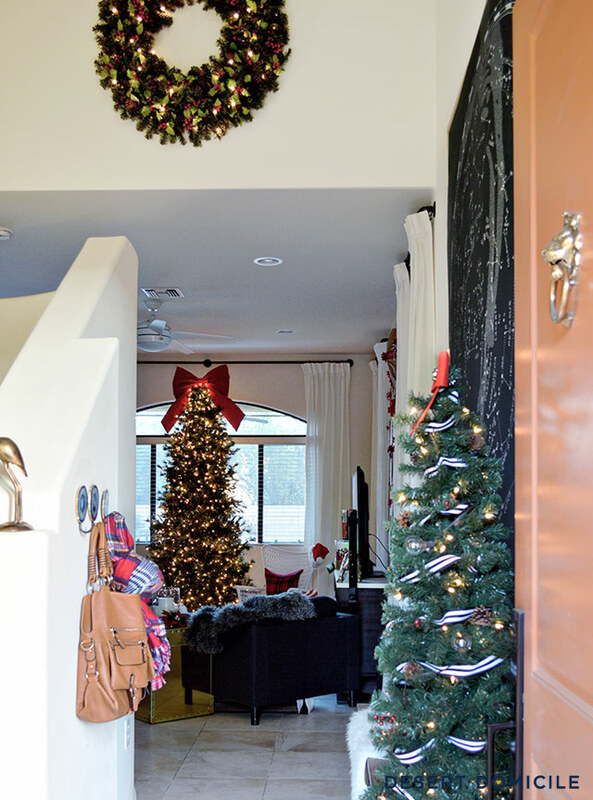 When Lindsey from The White Buffalo Styling Co. asked me to participate in her 2015 Christmas edition of Blogger Stylin' Home Tours, I couldn't wait to start decorating! Ready to check it out?! 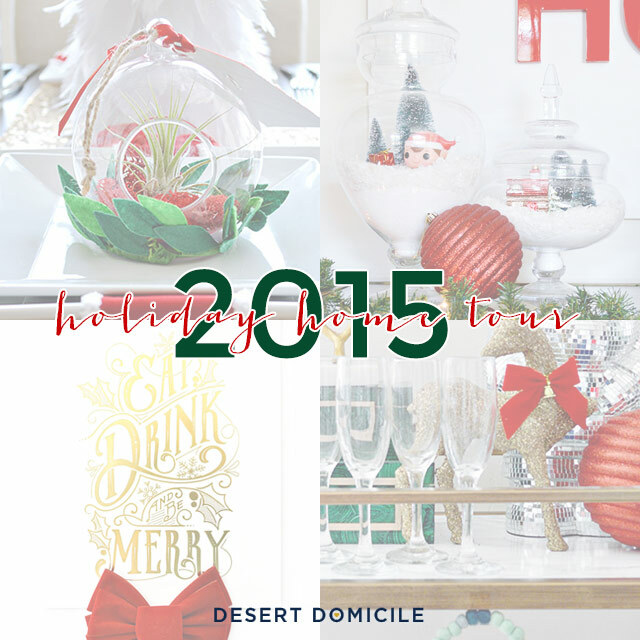 If you're stopping by from My Fabuless Life – welcome! Wasn't Jenn's tour amazing?! For those of you that are new here, we have an open concept home. This is the view you're greeted with after you make your way around our curved staircase. 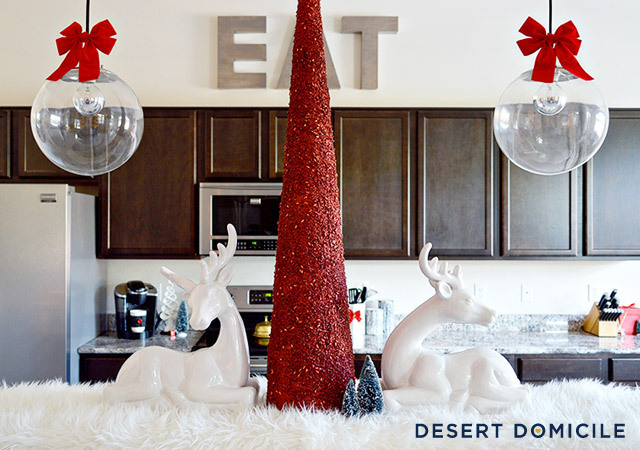 I added my favorite red bows to our pendant lights to make them look like giant ornaments. 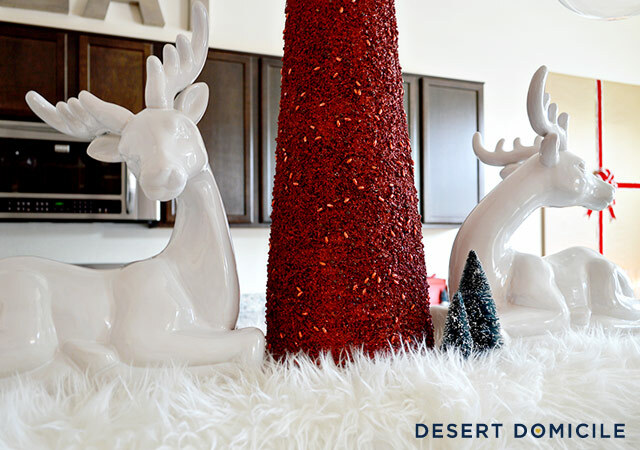 My favorite deer made their way onto our bar along with a mini tree forest! I filled my thrifted cake stand with ornaments and placed a wreath around it for our ottoman's centerpiece. 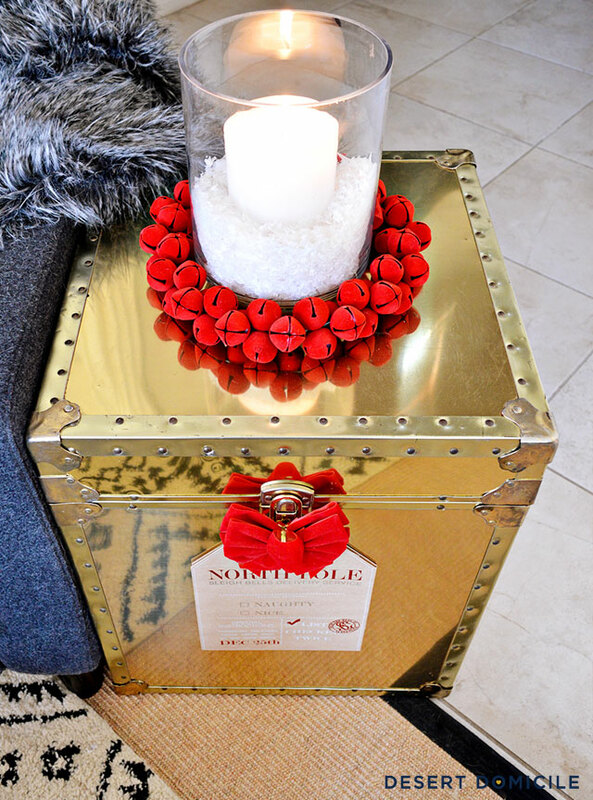 I moved my thrifted trunk over to the side of our gray club chair and added a bow and gift tag to it. The gift tag is actually a gift bag, I just removed the handles and taped it in place! 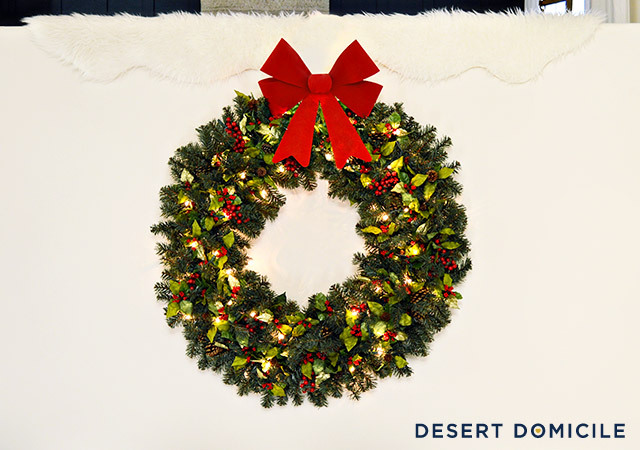 I topped the trunk with a glass hurricane that's surrounded by a jingle bell wreath. 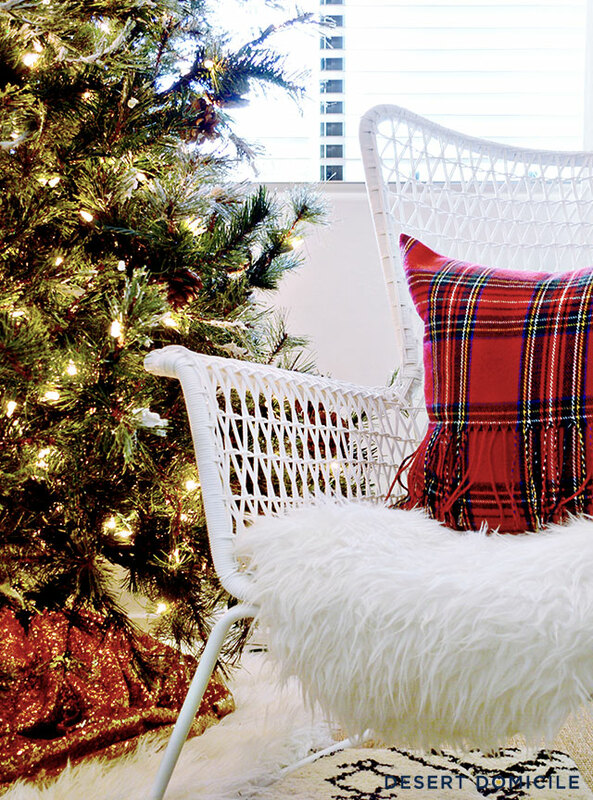 I always try and use as much of my existing Christmas decorations as I can to save money but I couldn't pass up these pretty plaid fringed pillows when I saw them at HomeGoods. They were only $17/each! I love how it sparkles when the lights hit it! We placed our Christmas tree in front of our large living room window this year. We haven't decorated it and don't plan to since we like how it looks as-is. We did add a giant 2' bow to the top of it though! Disclosure: this is not a sponsored post, I just wanted to highlight a nice gift from a great company I've previously worked with! I taped it to an 18" x 24" canvas and added a bow beneath it. 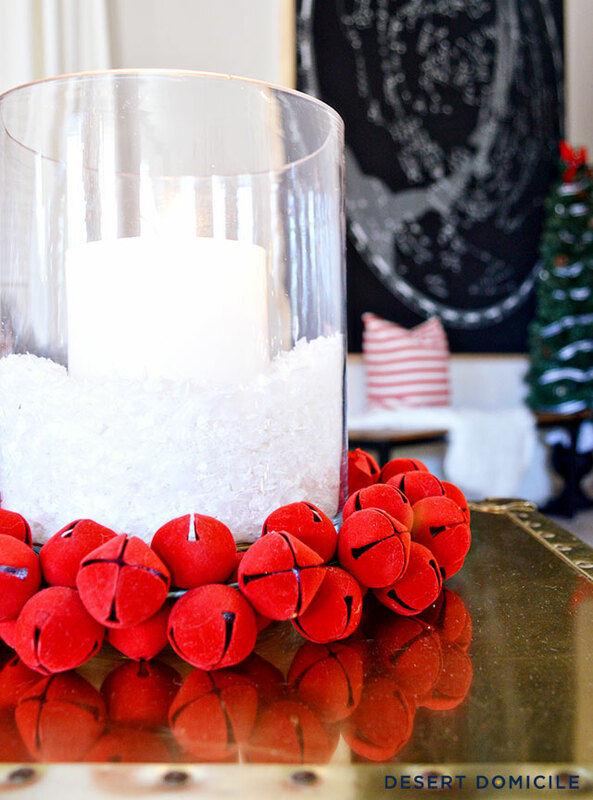 The handmade felted garland was a gift from Minted as well. 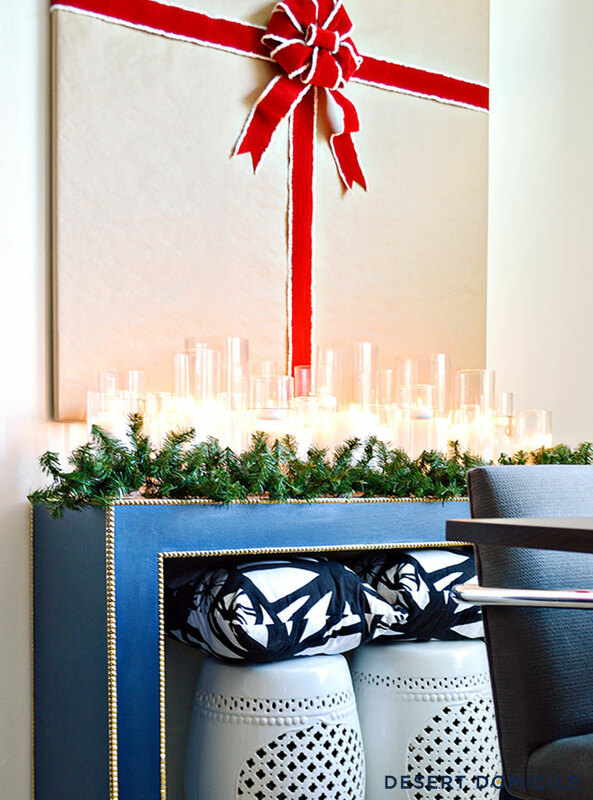 I love the blue and green palette and plan to keep it out after the holidays are over! 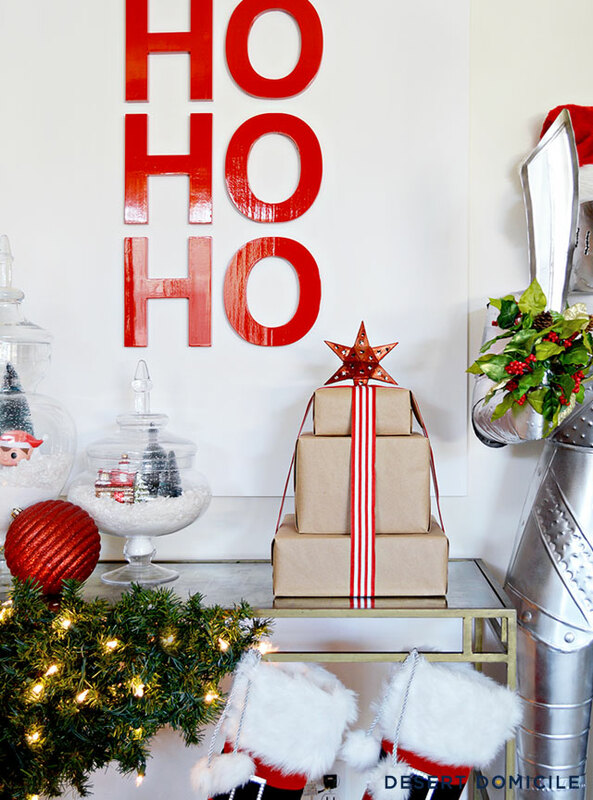 Here are the "Ho's" I previously mentioned! 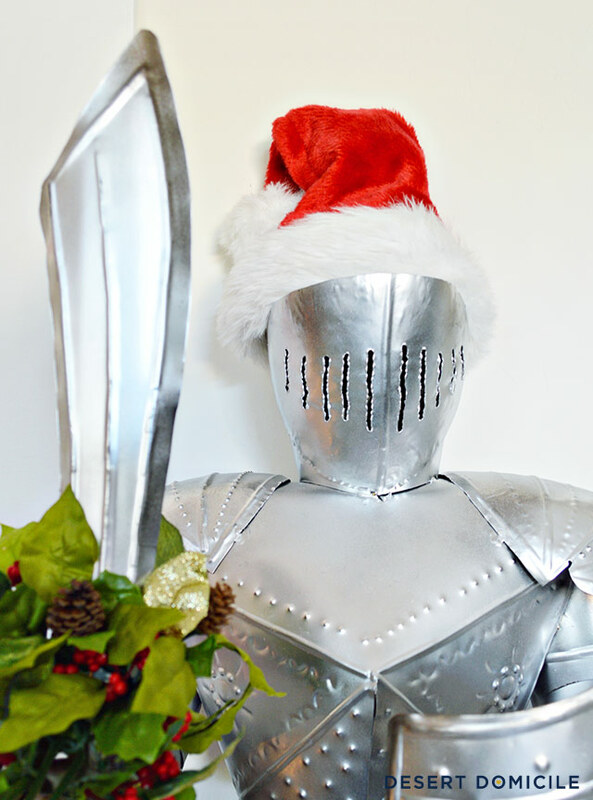 There's a story behind the knight! I got it for my husband's golden birthday on Halloween. 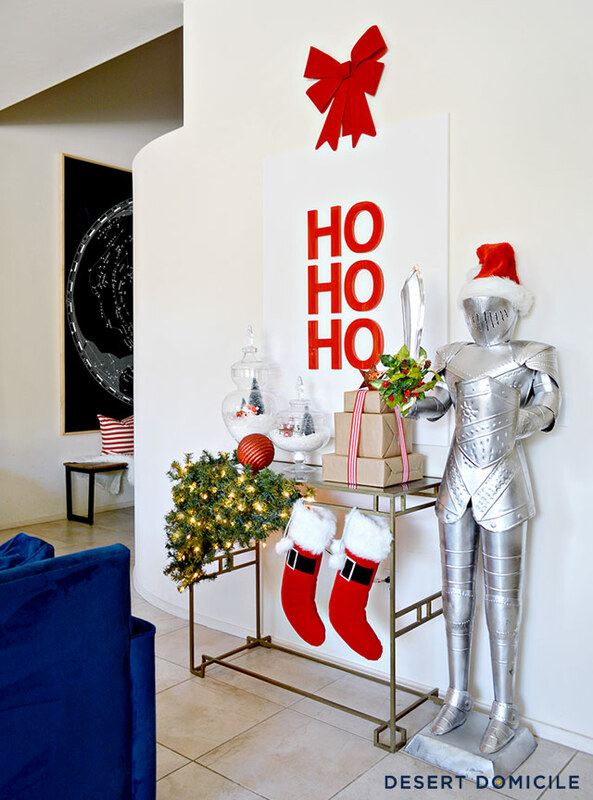 He had admired him at HomeGoods but I wasn't sure if he was being serious or not because, I mean, what does one do with a knight? 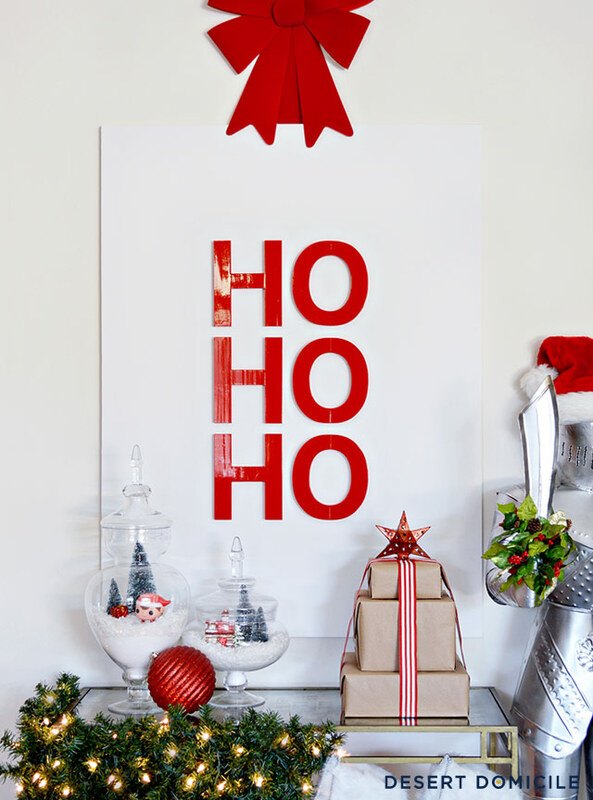 In case you're wondering, I made the "Ho, Ho, Ho" art and will be sharing the tutorial on Friday! 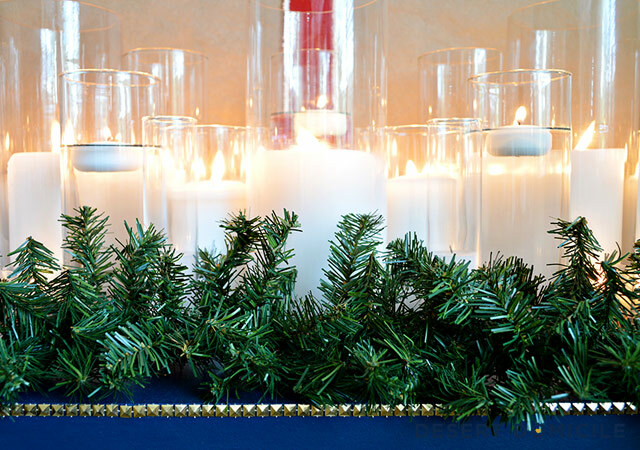 I hung it above our makeshift mantel (AKA the console table that sits behind our couch) and topped the table with a brown paper package tree and some snowy apothecary jars. 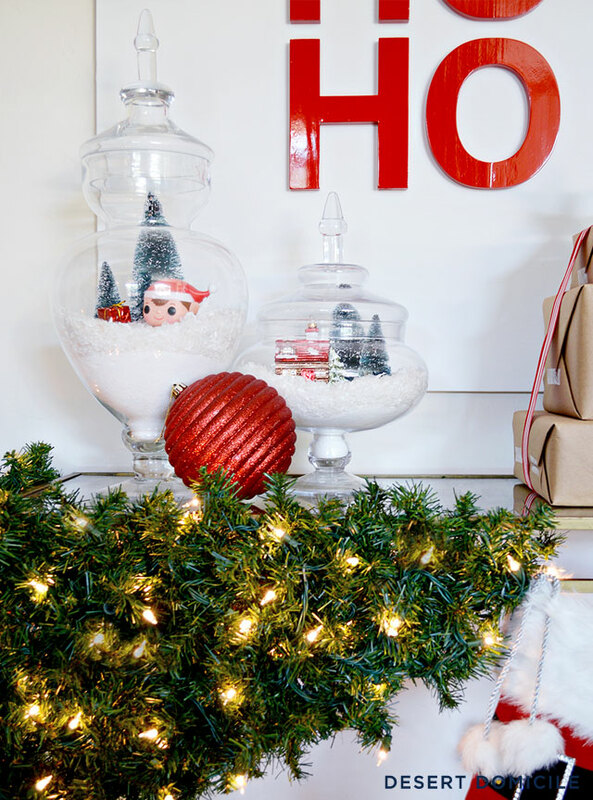 I filled the jars with some bottle brush trees, a POP figure Elf on the Shelf, and a $2.50 house ornament I got from Michael's. 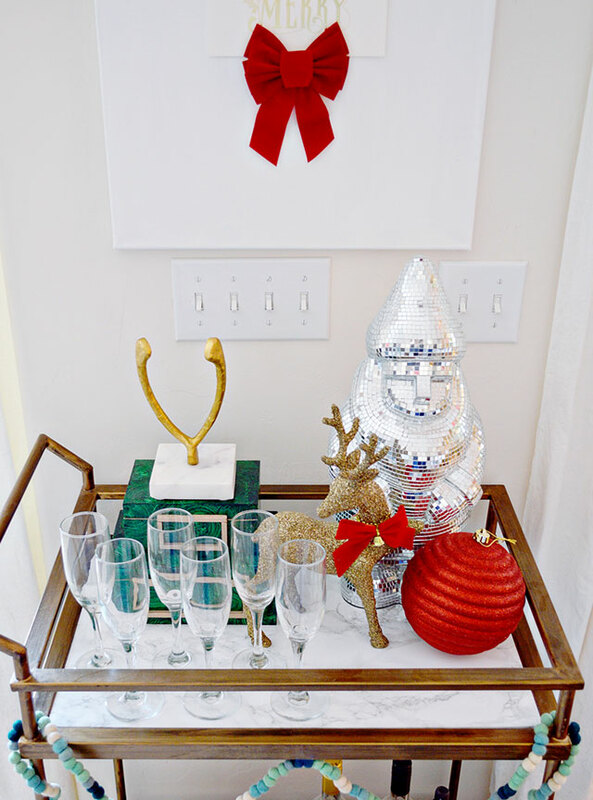 I repurposed the two gold sequin runners we had on the head table at our wedding for our Christmas table. 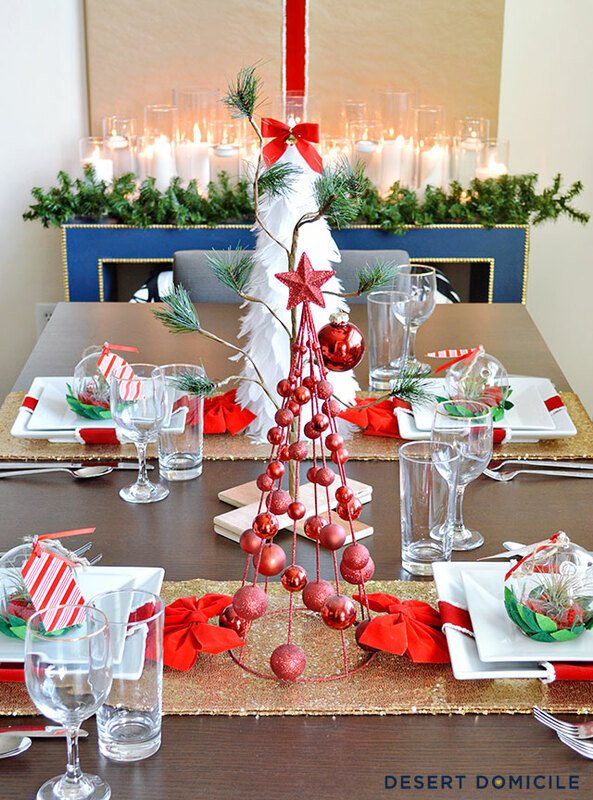 I lined the table with a collection of trees I've had for several years. 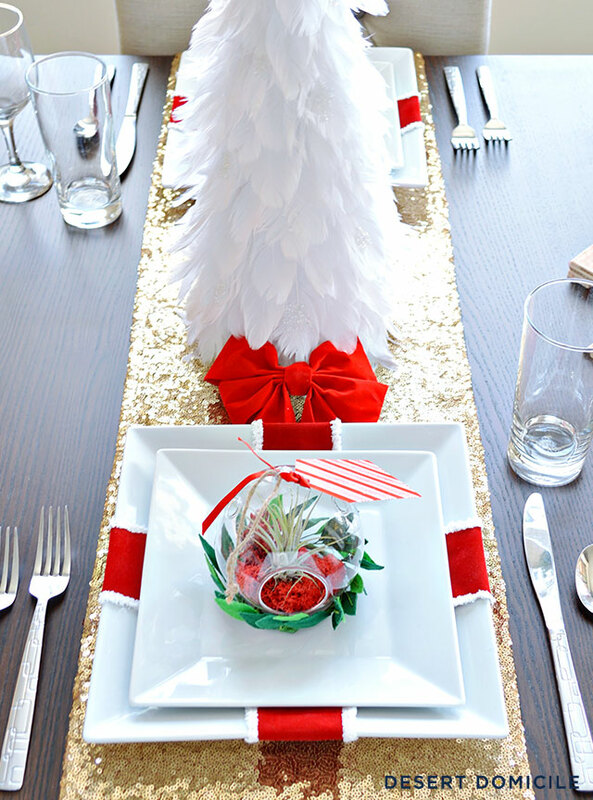 The place settings are quite possibly my favorite thing this year! 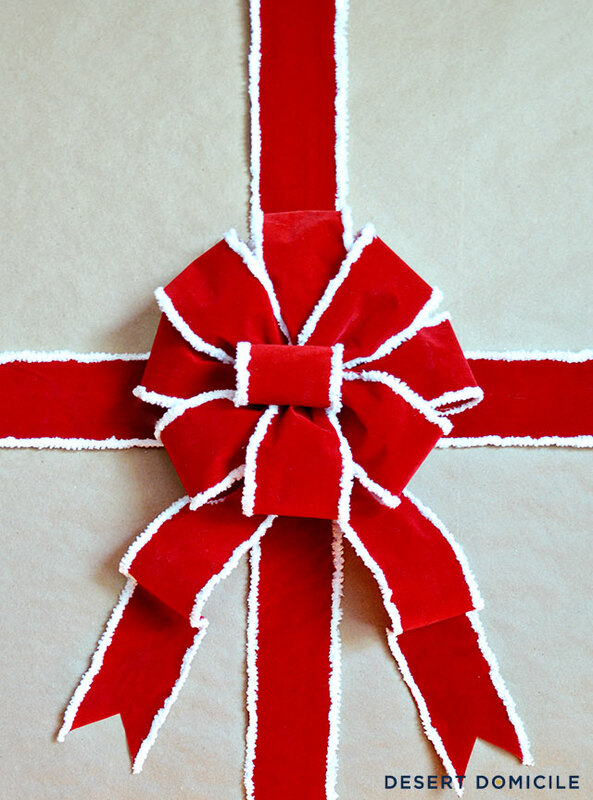 I wrapped a large square dinner plate with red wired ribbon and placed a bow at the top of the plate to mimic a present. 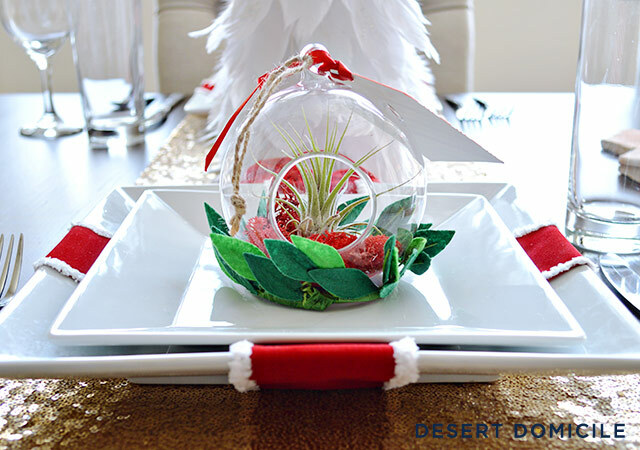 I placed an air plant filled glass terrarium ornament (say that 10 times fast) on top of the salad plate and wrapped a handmade wreath ornament around it (3 for $3 at Target!). 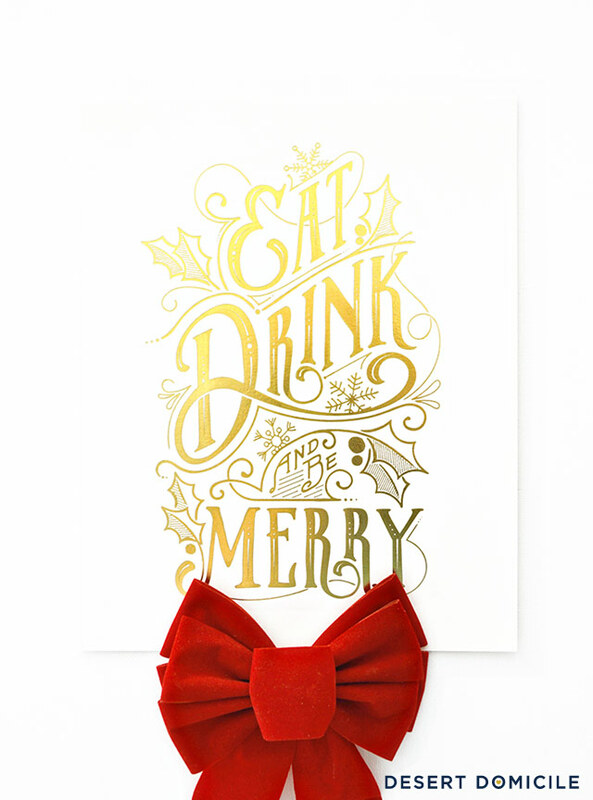 I wrapped the picture above the table up like a present and made a big bow for it! Well, that's it for my tour! Did you make it to the end?! Jenna at Rain on a Tin Roof will be sharing her tour bright and early tomorrow morning so don't forget to stop by and check it out! 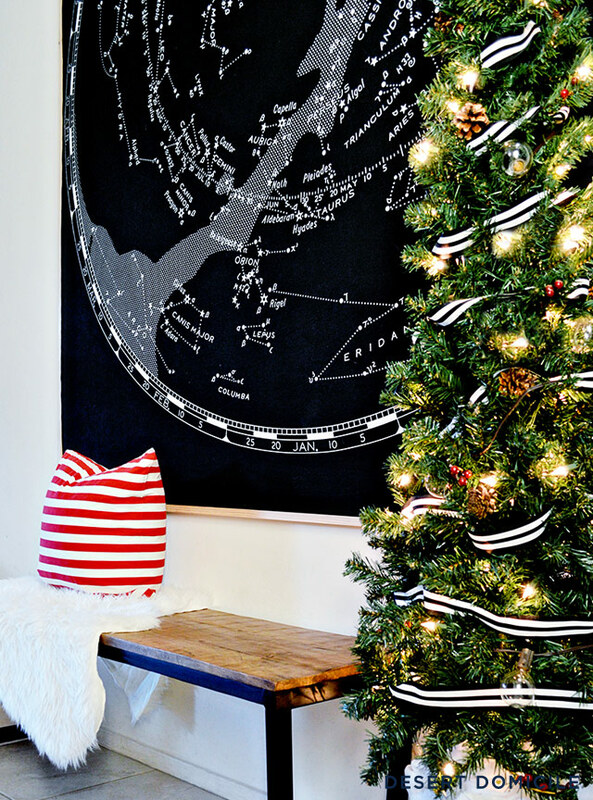 Love love love all your unique graphic Christmas touches. 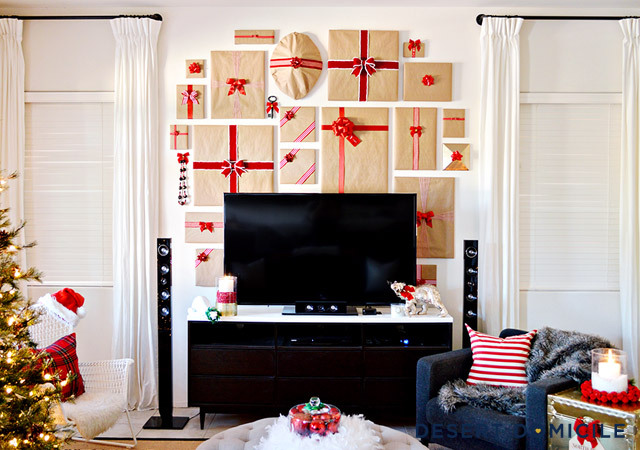 The wrapped gallery wall is so fun and different. 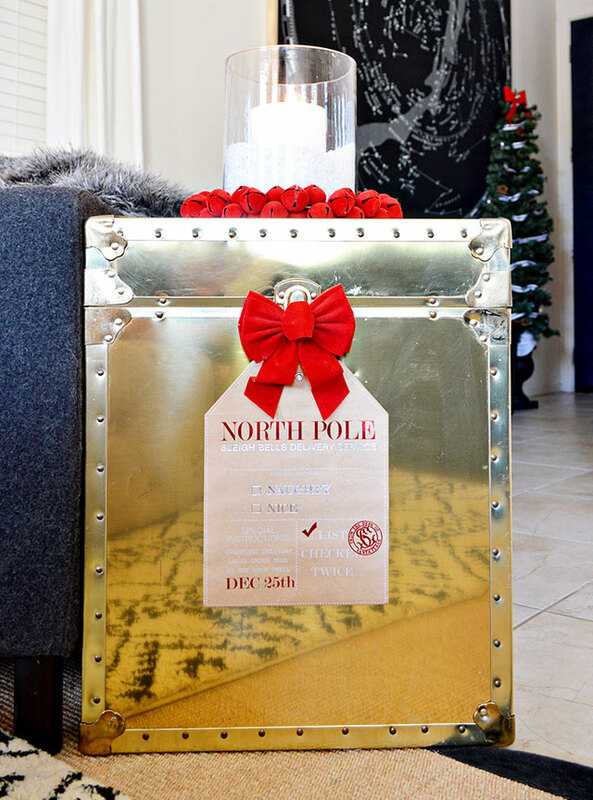 Love the NorthPole tag on the trunk too and of course the rest as well. I'm always thrilled to see your tours. Thank you so much Julia! 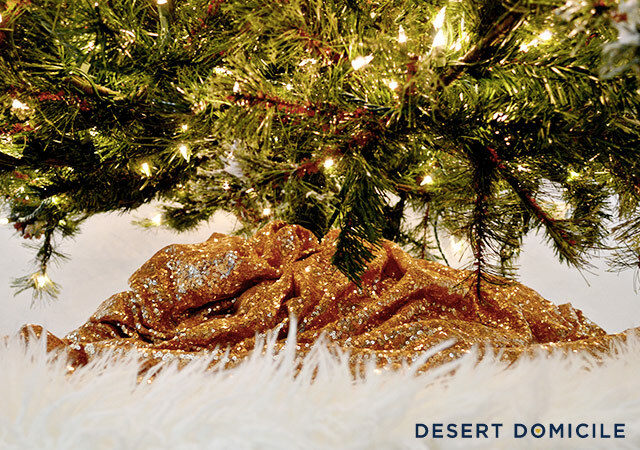 Your comment means a lot :) Happy holidays! Stunning tour, Caitlin! Love all of the red! I love every touch: bright and modern and "out of the box". Loving the wrapped gallery wall and the wedding elements re-purposed. 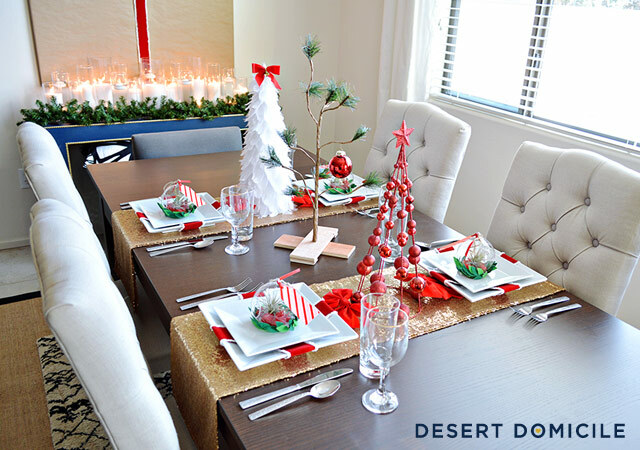 Your table setting is so fresh and fun. Even before I clicked over to your tour, I knew I'd love it—how fabulous!! 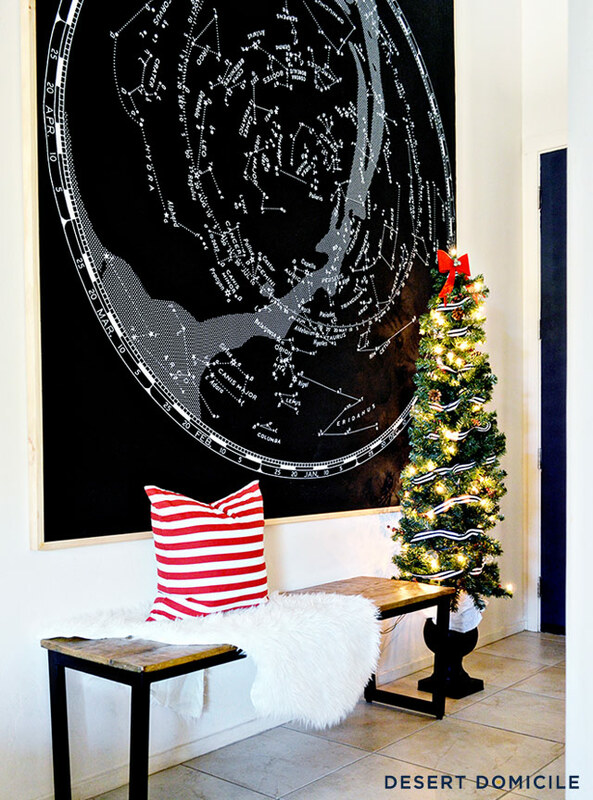 Your wrapped gallery wall is GENIUS!! Beautiful!!! The wrapped gallery wall is just so SO good!!! 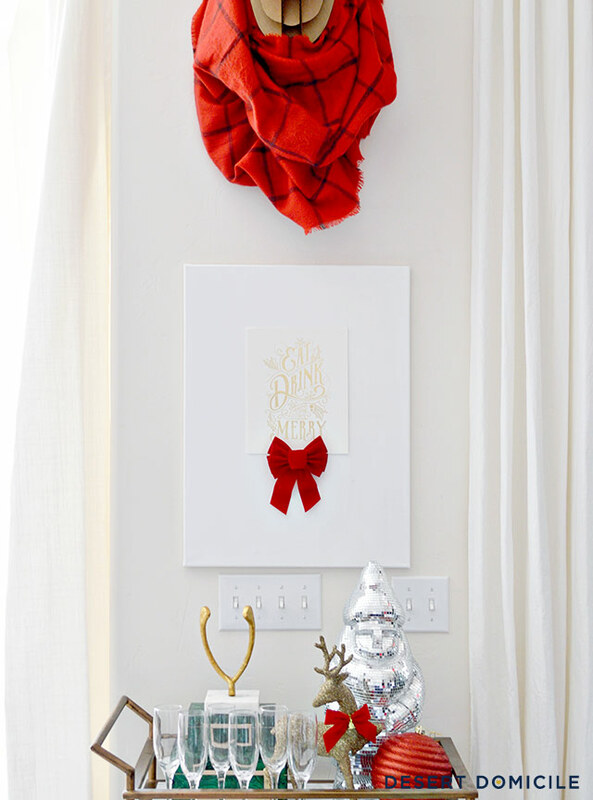 Love all your gallery wall all wrapped up as gifts looks so pretty. 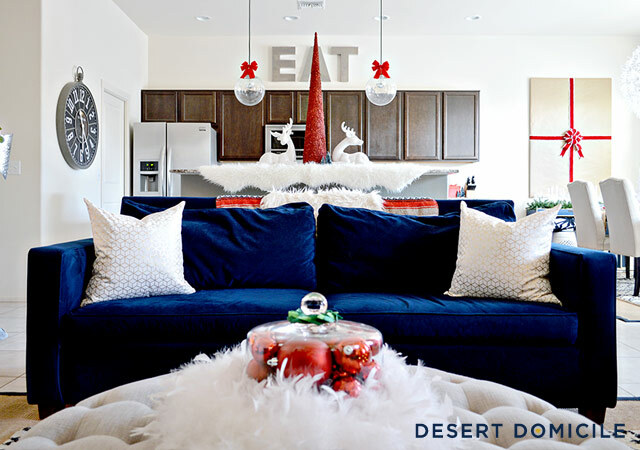 The color red shines so much in your home! Thanks Katrina! I'm so happy I took the time to wrap all the prints up. It took a while but it makes such a difference! 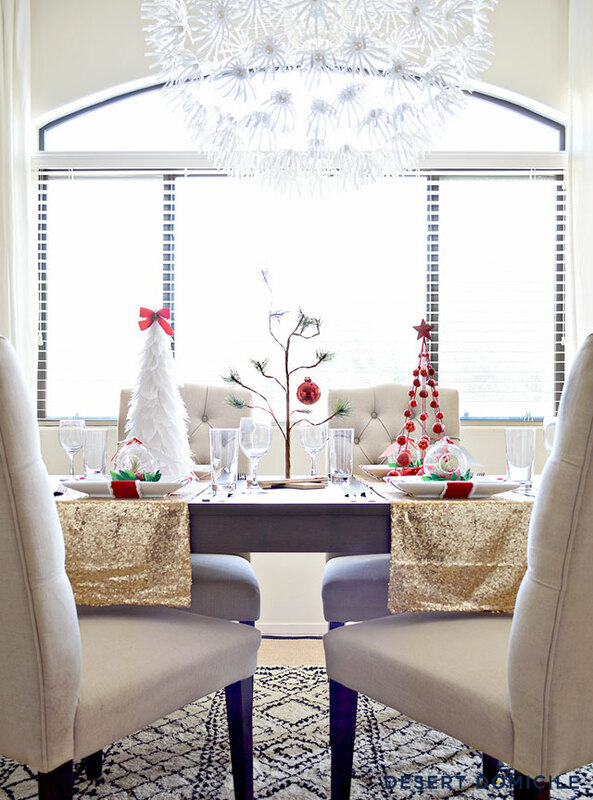 Love your dining table! 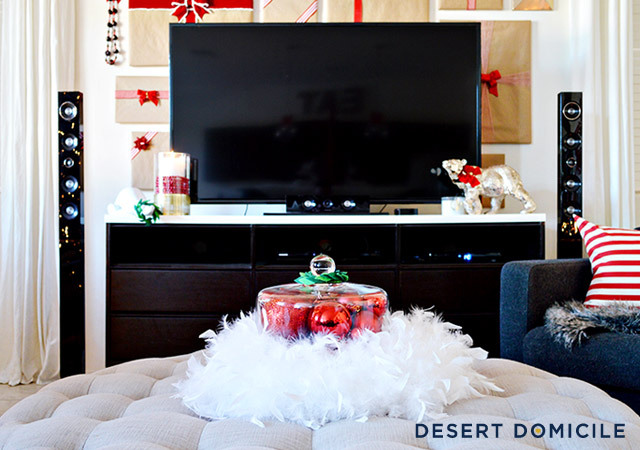 So pretty :) And love the packages on the wall behind the TV! 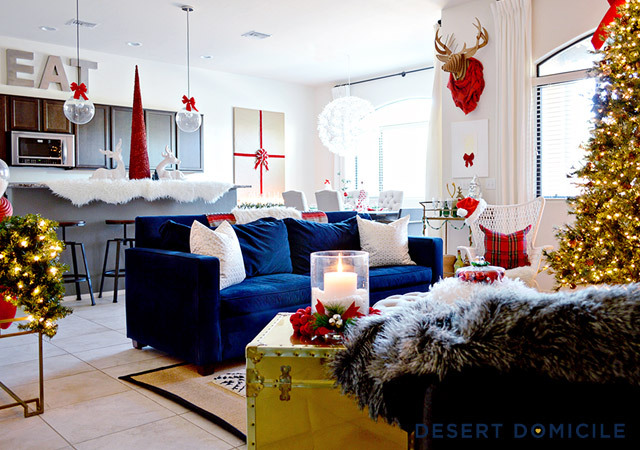 I love your bright and modern style! 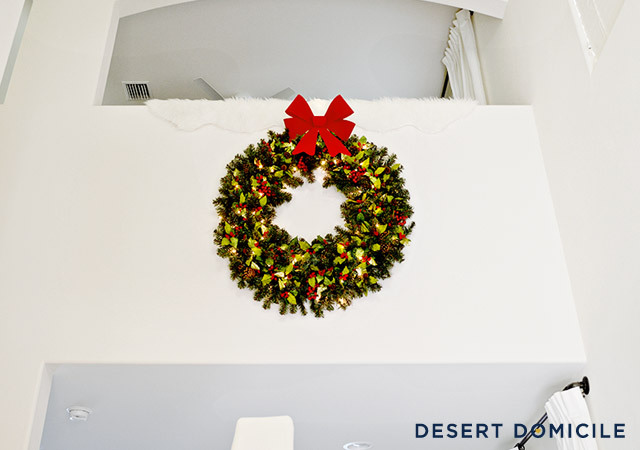 The big wreath outside of your loft is beautiful and the red bows are perfect festive touches! Your home is so pretty!! Looks like a winter wonderland! 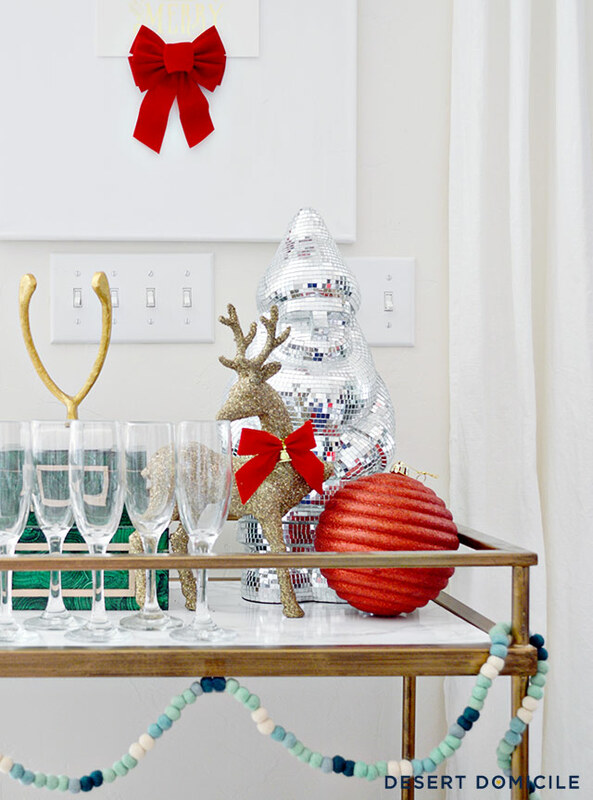 Such clever ways to celebrate the holidays. 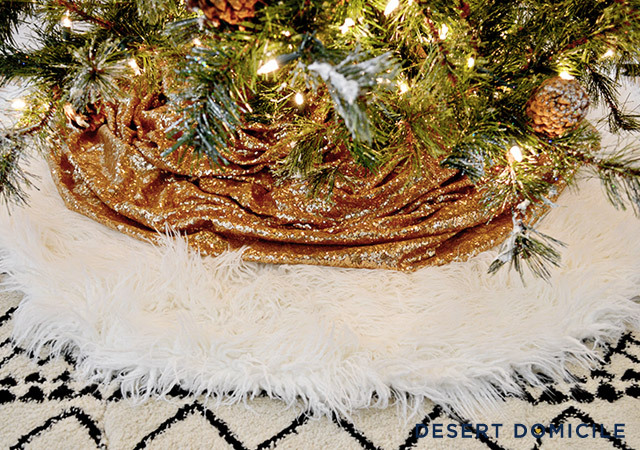 So festive! 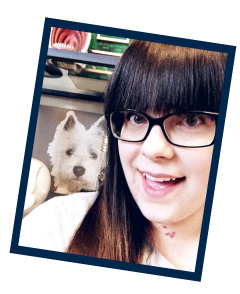 Love the red against your blue sofa, Caitlin! Why oh why must it all be so darn cute? Lol. I miss this place! I looooove the armor!!!! Wow, Caitlin! Beautiful styling and beautiful photography. 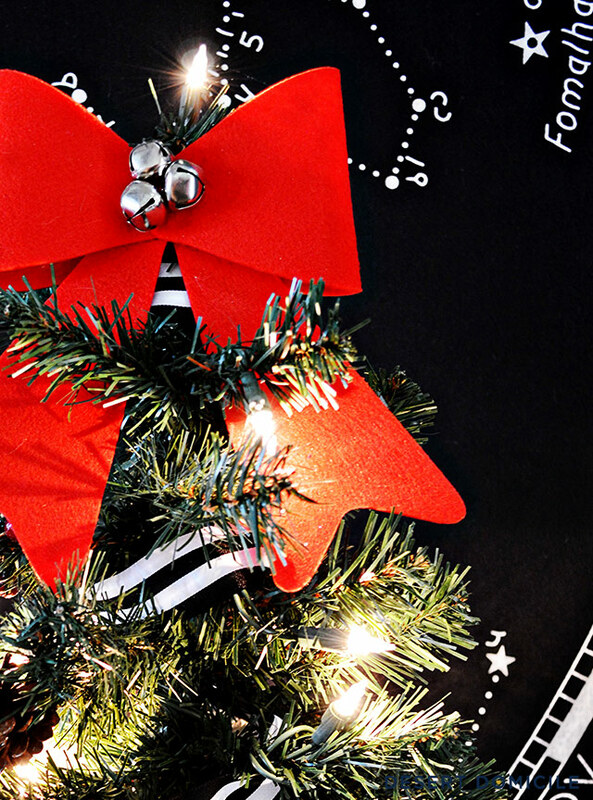 I love that present wall and the bows on the pendants are such a genius way to make them look like ornaments! How gorgeous! Love the red pops! Stunning! Love it as always! I love how clean and bright everything is! 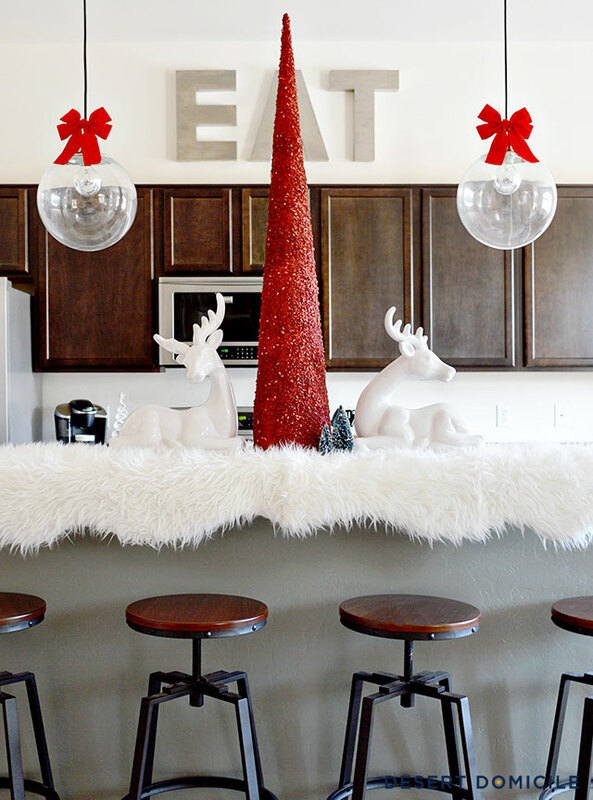 And turning the pendant lights into ornaments?! Brilliance! Stunning! 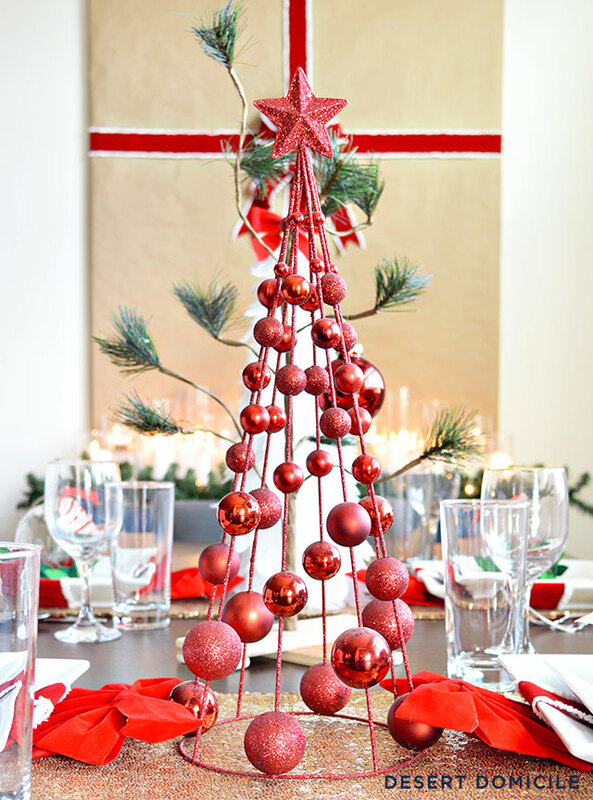 I love all the red and so many special touches. 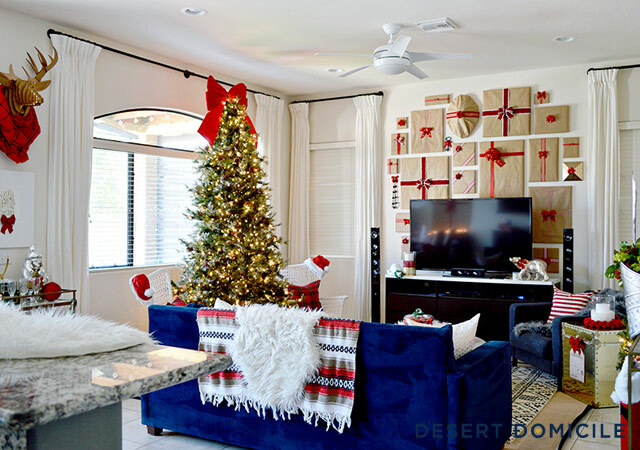 I can only imagine the hours spent wrapping and decorating! I'm a candleholic so the table of candles is perfect. 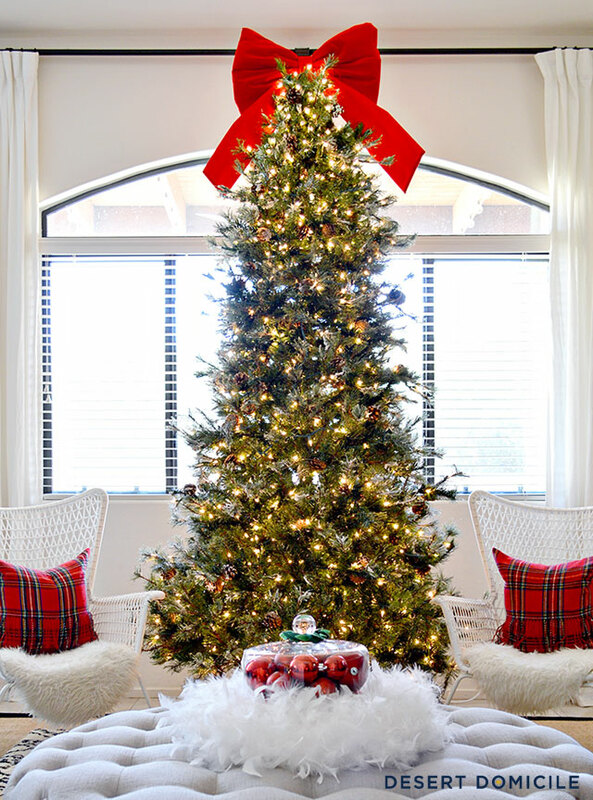 I think your tree is beautiful and I love the fact that you've chosen not to decorate it! You're a creative genius! Contact us to hire a limo services for your weddings and picnics and much more!!! !